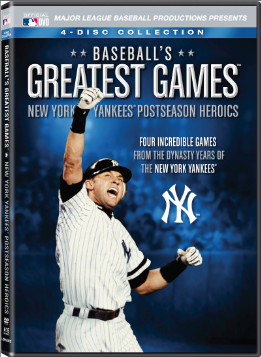 Relive some of Derek Jeter’s greatest moments as his final season comes to an end in Baseball’s Greatest Games: New York Yankees Postseason Heroics arriving September 9 from award-winning Major League Baseball Productions and Lionsgate Home Entertainment. For the first time in a single DVD set, this collection includes four incredible New York Yankees games including World Series games from 2000 and 2001 with Yankees radio audio. Complete with four discs, Baseball’s Greatest Games: New York Yankees Postseason Heroics will be available for the suggested retail price of $19.98. The most recent of the Yankees dynasties was very special, displaying not only dominance, but incredible heroics. From pitching duels and walk-off home runs to one of the most shocking defensive plays you will ever see, these four legendary games are in one box set for the first time ever. Title Copyright:©/TM 2014 Major League Baseball Properties, Inc. Licensed for distribution by Major League Baseball Properties, Inc. to A&E Television Networks, LLC. Major League Baseball trademarks and copyrights are proprietary to Major League Baseball entities. All Rights Reserved. Photos: Getty Images. Distributed by LIONSGATE® under license from A+E Networks Consumer Products™. The Rio 2 Summer Party Tour Is Coming To Your Hometown!